The much anticipated YADAL season got off to an exciting start at Match 1 in Cudworth. The day was filled with lots of PB’s, Club Records and League Records as 12 teams across three leagues began the battle for number one spot. Division Two: Scarborough AC made an impressive start in their first YADAL competition. 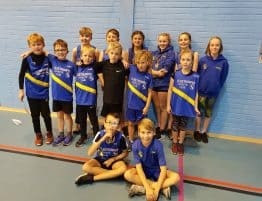 They were competing in Division Two against Holmfirth Harriers, Wombwell AC and Skyrac AC. The latter were relegated from Division One last season and were looking to bounce back at the first attempt. The new addition finish second (292 points) behind Match 1 winners Skyrac AC (339 points). Holmfirth Harriers finished third (229 points) ahead of Wombell AC in forth (57 points). The highlight of the Division Two match came in the form of Kristie Archer (Wombwell AC) in the U17 Women’s Long Jump. Kristie jumped an impressive 5.10m to break the previous league record of 5.06m (R. Winspear – Barnsley AC – 2015). Division One: A much tighter match in Division One saw just 15 points separate the top two teams with Halifax Harriers taking the top spot after last years relegation from the Premier Division. They were helped to a total of 513 points thanks to a strong team performance and brilliant running from Isabelle Bloem who set the standard in the inaugural U15 Girls 300m. Bloem’s time of 42.3s was the best from all divisions on the day which meant her name will go down in the record books. Keighley and Craven AC finished in second place with 498 points. Harry Lewis with their standout performance on the day in the U17 Men 1500m Steeplechase. Harry ran 4:58.5 to beat the previous best of 4:59.2 (A. Stewart – Skyrac AC – 2016). 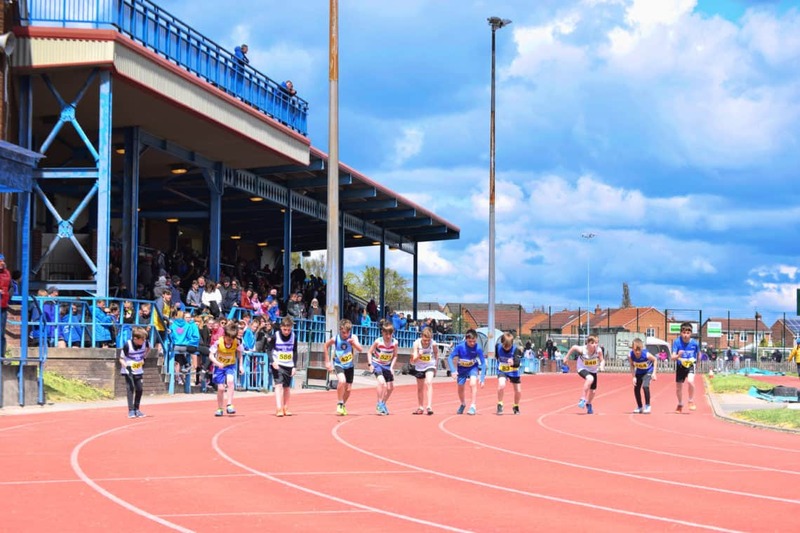 Barton & Goole AC finished in third (462 points) as they looked to establish themselves in Division One after winning Division Two last season. They finished ahead of Pontefract AC (398 points) who will have some work to do to improve upon their placing in the first match. 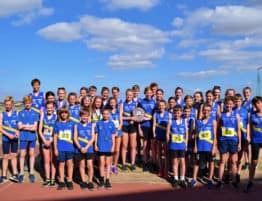 Premier Division: The Premier Division provided lots of exciting action as heavyweights Cleethorpes AC and Wakefield Harriers battled it out at the top. Again, another tightly run affair with only 16 points separating the top two as 11 league records tumbled across this division. Cleethorpes AC are five-time defending Champions of the Premier Division having won the league every year since its inception. It is sure to take something special to overhaul them again but Wakefield Harriers will be hot on their heels all the way. Cleethorpes AC began their campaign with three league records. Ella Greenway stormed to 2:19.7 in the U15 Girls 800m to equal the record set by I. Castelow (Halifax Harriers – 2016). Ella later went on to form part of the 4 x 300m relay team which set a new mark (3:19.3) in the first series of races since being introduced. She was joined by Katelyn Howden, Charlotte Davies and Tia-Mae Christy. It was also Cleethorpes AC U17 Women who equalled the 4 x 300m record set in 2013 by a Wakefield Harriers quartet with 3:00.0. 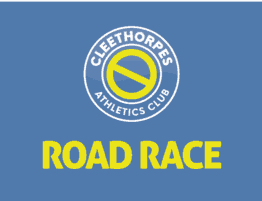 Cleethorpes AC posted a very strong total of 629 points which would have been a score capable of winning every league match last season. However, it was Wakefield Harriers produced that something special with a huge 645 points to win the Match 1. They were helped along the way by no fewer than SEVEN league records by their male team which is a huge testament to the fantastic work put in by both the athletes and their coaches. There was a double record breaker in the form of Thomas Wood who did the sprint double in the U17 Men 100m and 200m. Wood equalled D. Walsh’s 11.1s (Longwood Harriers – 2013) in the 100m and beat S. Mattocks 22.9s (Wakefield Harriers – 2014) with a time of 22.7s. He was also joined by fellow team mate Jack Cherry who broke the U17 Men Long Jump record with 6.42m. The previous mark of 6.09m set by D. Whylie (Halifax Harriers – 2014) was well and truly beaten. In the same Long Jump competition Alfie Edwards produced an outstanding jump of 5.73m to beat the U15 Boys Long Jump previous best of 5.68m set in 2016 by fellow team mate Aran Thomas. Alfie also went on to vault 3.20m to break E. Dundavin (Wakefield Harriers) 2.80m Pole Vault set in 2013. As Aran saw one of his records erased he went on to break two new ones instead in the form of the U17 Men Shot Putt and Discus. There seems to be something that Aran enjoys about Cudworth as he beat last year’s marks of 12.16m (Shot Putt) and 40.40m (Discus) with 13.71m and 50.23m respectively. Aran set both of the old mark at the same stadium last year and was just shy of beating the Javelin record as he threw 45.77m. Longwood Harriers managed to grab third spot (428 points) ahead of hosts Barnsley AC (403 points). However, consolation for Barnsley AC was in the form of Larissa Pickering’s 4.44m jump which equalled the U13 Girls Long Jump record set by fellow Barnsley AC athlete J. Newsome (2015). Well done to all athletes and team managers for a brilliant Match 1. Thank you to all teams that provided officials on the day. Without them the day would not have been able to take place. We ask that all teams ensure that they support the league by providing the full quota of officials, especially on the field. Lastly a big thank you to Fiona and Maria who worked tirelessly to get the results sorted despite technical difficulties on the day. We look forward to seeing you all at KGV Stadium, Grimsby for the next match hosted by Cleethorpes AC.